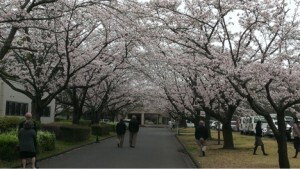 Meetings during cherry blossom time means coffee breaks are spent outside more often. 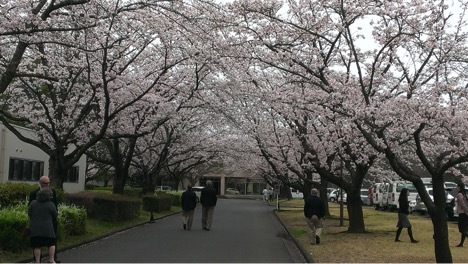 On 4 and 5 April last week, during the peak of the cherry blossoms in Japan, I attended the 38th US-Japan Joint Committee for High Energy Physics meeting at the KEK laboratory in Tsukuba, Japan as part of the US delegation. These metings happen annually and the location alternates between Japan and the US. The total attendance this year was about thirty, with 13 members from the US and 17 from Japan. The meeting was chaired jointly by Glen Crawford from the DOE HEP office and Yasuhiro Okada from the KEK directorate. US attendees were mostly from national labs in the US and from KEK and universities in Japan. Okada opened the meeting mentioning the new bi-lateral framework for cooperation in HEP between the two countries that was signed in October 2015 in Tokyo, and that ensures the existence of the US-Japan Joint Committee. In his talk, Glen Crawford reminded us that the US is implementing the P5 plan and that an important recommendation of that plan is that HEP is global and the US supports the global programme. He pointed out that one of the steps in the P5 plan is support for the ILC and expressed concern about no decision about the ILC in Japan, especially in light of other options becoming available. The core purpose of the annual meeting is the presentation of the status of currently supported work under the US-Japan agreement and newly proposed work. This year there were 16 projects that received continued support and four new ones were added from the ten proposals submitted to this year’s competition. It is a very diverse and rich programme and reflects the areas where there is collaboration between the HEP programmes in both countries. The following three experiments are supported: the Heavy Ion program at RHIC, GLAST and CMB measurements with POLARBEAR II. On the accelerator side support is given to R&D for SuperKEKB and next-generation colliders, superconducting coils for the interaction region of SuperKEKB, high-gradient research, developoment of a superconducting solenoid for a superconducting ion linac, as well as Linear Collider Accelerator Technology for a total of five projects. There are a total of eleven areas of supported detector R&D, including support for GEANT4 development, R&D for Kaon, rare muon, ILC, neutrino, RHIC and Belle II experiments as well as support for a data center for Belle II and development of new magnetic horns for neutrino beams. It should be noted that the Particle Data group is also supported by this programme. All these projects are done jointly in Japan and the US. We also heard an overview of the KEK DG, Masanori Yamauchi of the KEK programme. Yamauchi emphasised that the new fiscal 2016 year had just started on 1 April in Japan, that SuperKEKB has circulating beams at about 10% of its nominal current that are being used to “scrub” the machine, that the Belle II detector upgrade is on track for beam in 2017, at JPARC the Kaon hall runs three charged and one neutral kaon beam, the rare muon decay experiment, COMET, has had a commissioning run and is scheduled to start taking data in 2010. The ILC was mentioned on several slides describing ATF, the expanded Superconducting Test Facility (STF), detector work on ILC and describing the ILC working groups at KEK. After this Andy Lankford described the progress on the implementation of the P5 plan in the US, including the signing of the DOE-CERN agreement, the formation of the LBNF/DUNE collaboration and engagement in the global discussion about the ILC. He went through the list of projects supported by the programme and described their status. Yasuhiro Okada summarised the status of the ILC in Japan, starting with a brief history and then describing the panels that have been set up to advise the MEXT ministry on next steps. He repeated the need for discussions with other countries about foreign contributions and that LHC results need to be monitored closely and taken into account . KEK will continue accelerator R&D at its facilities, provide the MEXT ILC Advisory Panel with requested information and has developed an action in preparation for a positive decision by MEXT. Dimitri Denisov from Fermilab described the status of LBNF/DUNE neutrino programme. The Long-Baseline Neutrino Facility LBNF will provide the 1.2-2.4MW neutrino beam, as well as caverns and infrastructure at the Sanford Site in South Dakota. DUNE is the collaboration operating the four planned 10-kT liquid argon TPC detectors at the far and near detectors. DUNE has 805 collaborators from 27 nations and 146 institutes. R&D on liquid argon detectors continues and an important ingredient is the protoDUNE detector being built at CERN. 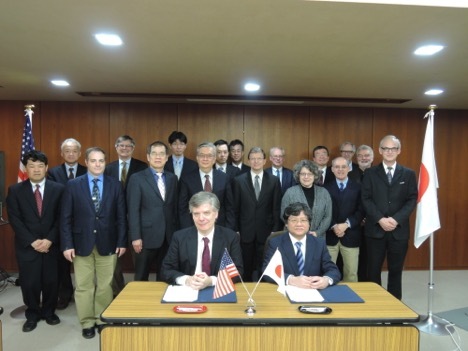 Regarding the ILC at this meeting, for me the take-away message was that there is progress in Japan, in terms of funding R&D on SRF, directed at possibly reducing the cost and enabling SRF cavity and cryomodule production in Japan. Working groups for ILC have been set up at KEK, there is an action plan for ILC at KEK and MEXT is waiting for reports from the several committees that have been setup. A decision or green light on the ILC from MEXT is a complex process in Japan and my sense, which may be wrong, is that it will take another two years before such a step can be announced. It should be noted that both Andy Lankford and Glen Crawford mentioned that the US is waiting for a sign on ILC from Japan.